Sometimes I am just too close to a subject and I have to step back and remember that most people have little or no training in tires. I just read a post where someone claimed to have read the tire date code and interpreted the code as indicating the tire was five years old when in reality the tire was 15 years old. Now I know there and been a number of posts telling people how to read the date code but clearly there is still some confusion. So I did a quick search for pictures I could find of actual date codes. First off we need to remember than in 2000 the DOT serial date code changed from a three digit date code to a four digit date code. The DOT serial is a series of letters and numbers that come after the symbol DOT on the sidewall of your tires. Also the complete serial that includes the date code portion is not normally on both sides so you may need to do some crawling around. You might even get your son or daughter or even your grandkids to help. You can also look at passenger tires to get some practice. I know a number of companies mount the tires with the full DOT serial on the outside so it is easier to read but I do not know of any RV manufacturer that has an official policy of making the full serial be on the outside. So lets look at some examples. This example on the left is 41st week of 1994 or possibly 41st week of 1984. This is a good example of why the date code was changed to four digits. and below we have an example of 37th week 1998 on the left and 7th week 2009 on the right. 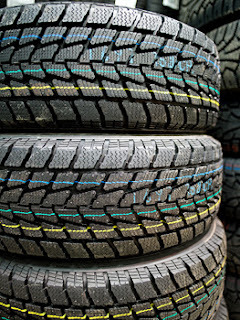 If you want to look up the location of the plant that actually made your tires you can go to THIS web page.